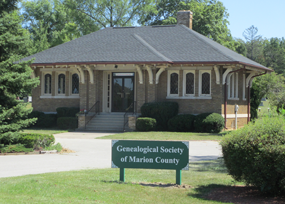 In August of 1995, a group of genealogists gathered in the Indianapolis Public Library to explore forming a local genealogical society, and as a result the Genealogical Society of Marion County Inc. was established. The new society adopted a set of bylaws, chose officers, and determined a set of goals. These goals, unchanged since that initial adoption, have driven our society ever since. In 1996, the GSMC was incorporated in the state of Indiana as a non-profit organization and that same year, was granted 501(c)3 status by the IRS. In pursuit of our goals, we have hosted dozens of genealogical speakers, published a bi-monthly newsletter and a quarterly journal since our inception. We have steadily compiled and published reasearch materials on Marion County, and after receiving an Indiana Heritage Grant; we compiled cemetery readings of Pike and Decatur Townships and published our work. In 1998, we established the Marion County Genealogical Library at the Crown Hill Waiting Station building and have been steadily acquiring materials for researchers. In 2013, we relocated to a free standing building located in Memorial Park cemetery on the eastside of Indianapolis. Our library continues to grow with a focus on Marion County research materials including a large selection of local high school yearbooks and histories of local businesses and organizations. We are also an affliate FamilySearch library with the ability to order and view FamilySearch genealogy microfilm. We host genealogy classes on a variety of topics and a friendly and knowledgable staff who are always available to help visitors with their research. Welcome to the Genealogical Society of Marion County's website. Wander around! Check it out! Bookmark it! We are continually looking to add more databases, more links, more information, and more publications. PayPal capability is available for Memberships and publications. All back issues of Indy Lineages newsletter since 1996 are online. Additional information is available in the Members Only area, where we have added back issues of Family Quest journal and several other databases. If you are not already a Member, join us! Our Library, at Memorial Park Cemetery, is continuing to grow, as we acquire new publications. We have added Wi-Fi and new PC's. See the Library page for Library hours. We can be open at other times for an orientation tour or research. We have members and non-members contributing articles and information to both Indy Lineages, our bi-monthly newsletter, and Family Quest, our quarterly journal. We welcome your contributions of family stories, pedigree and descendent charts or narratives, etc. Contact Us. GSMC offers a variety of programs. It’s not purely “Marion County” – the strategies for researching birth, marriage, death, probate, military, and other information don’t stop at the county line! You can look forward to a continuing series of excellent programs We even try to keep you informed of programs for other organizations – check out the Events calendar! Have you got a research problem? A ’brick wall’ or just an inability to find or access the correct info? Contact our Research Committee. We exist to assist our members in their research for their ancestors and we invite you to join us! We are very interested in your thoughts on the Society, what you would like to see, and how we can assist you in your research. Please feel free to contact any of us. We hope to hear from you soon and that you will consider becoming a member. To see Annual Reports on activity, click here.